Photo of Tuesday Weld via Classic Film Scans (thanks again, Julia who posted this indescribably beautiful Roddy McDowall home video of Tuesday in 1965). "Hollywood was scandalized when [Tuesday Weld] turned up for a TV interview with bare feet and a dress which Louella Parsons described as a 'burlap nightgown'." —LIFE July 26, 1963. 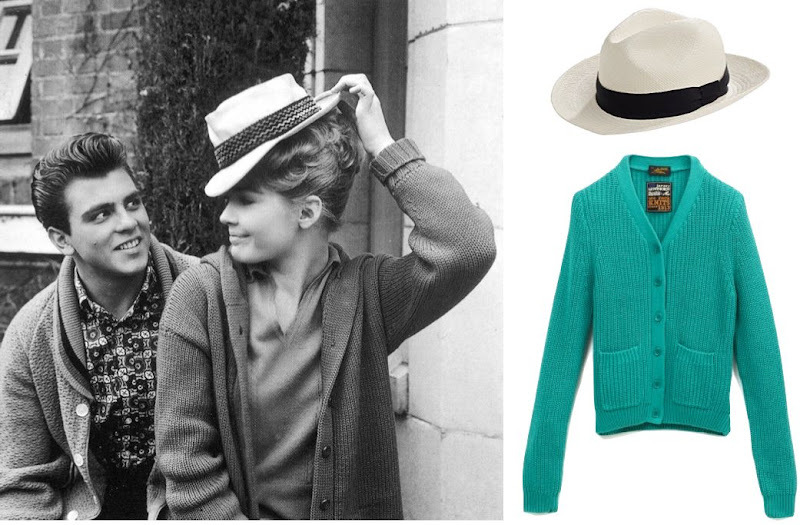 Biltmore Panama Hat ($58); Rib Cardigan by Le Mont St Michel ($295). Love the colour of the cardigan! She has such distinctive features and yet is soft at the same time. Panama Hat, I want you! That video makes me want to weep for coastline afternoons past, and to come. I love how childlike (cliche I know) Weld's wonder is while playing with the dragonfly. haha that quote is great! I agree the cardigan's color is super! i adore her! one of my most memorable undergrad projects was on tuesday weld. she's just darling! absolutely loving the home videos. tuesday is adorable.